July 11, 2018 July 19, 2018 - by Alex Owen-Hill - 2 Comments. Traditional machining automation has a lot of problems when you have many varied operations. But, robot machining could simplify your life! Brian is the head of production in a small machine shop. Business is going well, but the team has run into a problem. A particular finishing task for one large part that they produce is holding up their operations. The task is vital. Without it, they can’t produce a quality product. But, it is dull and it’s stealing time from more value-added tasks. The task includes steps of grinding, drilling, deburring, and polishing. Everyone on the team hates doing it because it takes a long time and distracts them from more productive work. Several members of the team have suggested that they try to automate it. However, Brian is unsure. We all have tasks in our job which we hate. Usually, we hate them because they are boring, repetitive and mindless. What’s worse, they distract us from other, more useful, tasks that we could be doing. But, what if these machining tasks are vital to your process? This is the problem that Brian is facing. Brian decides to look into automating the task with traditional CNC machines. However, this option just doesn’t seem feasible to him. The piece is too big to fit into most machine tools and opting for extra-large machines wouldn’t be cost effective. Plus, the task involves a lot of varied steps. you need a CNC milling machine. If you want to automate polishing, you need an automated polishing machine (although these are usually designed for high-volume, low-mix manufacturing so they wouldn’t suit his situation). Brian’s problem is that each of these operations is only a small part of the overall task. It doesn’t make sense for him to buy a specialist grinding machine, for example, just to trim off a few burrs per part. A lot of machining tasks fall into this category. Taken in isolation, they don’t take much time. However, when a task includes many small but varied machining steps, it can add up to a lot of work. Of course, he could hire a new employee to handle this task. However, it’s not a desirable job and the task is only required for four months per year so he can’t really justify a new hire. It seems that Brian is stuck. He can’t leave the process as it is currently because the task is negatively affecting production and team morale, he can’t automate using traditional m achine tools, but he also can’t hire a new employee because the part is not required all the time. Brian’s situation is perfect for robotic machining. A robot has the potential to simplify his life considerably. Robots are very flexible. You can program them to perform a huge variety of operations. With the help of a tool changer, you can even perform multiple machining operations in the same program. He can use the same robot for the whole task, including the grinding, drilling, deburring and polishing steps. He only has to buy one machine: the robot. Plus, for the eight months of the year that the part isn’t needed, he can easily reprogram the robot for other tasks. 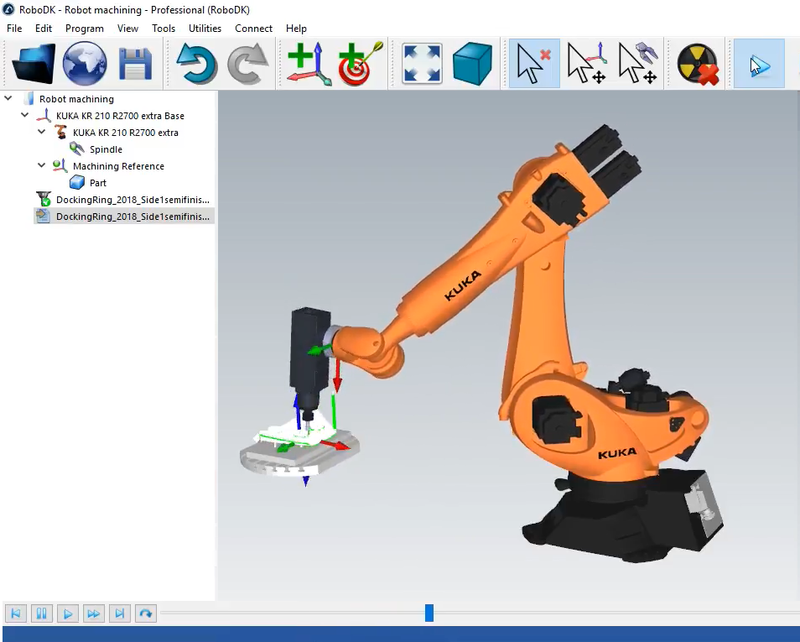 Are Robots Accurate Enough for Machining Tasks? At first, Brian is unsure about the idea of using a robot. He has heard that robots are not accurate enough for machining operations. He worries that he might invest in a solution that won’t be able to achieve the required level of performance. 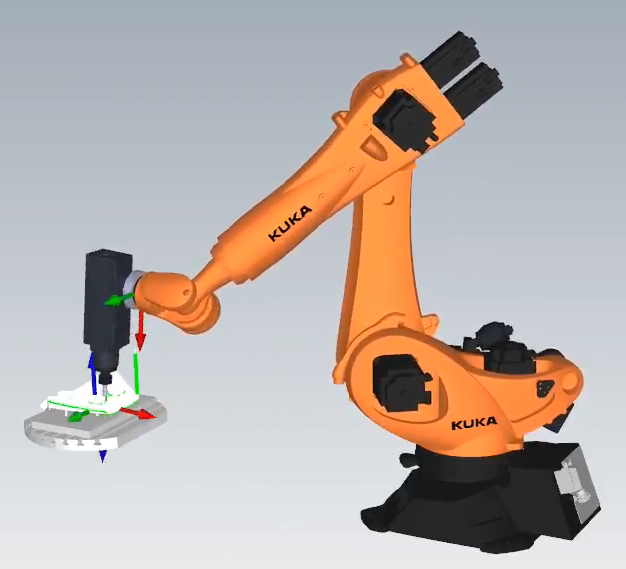 Accuracy is a common concern when it comes to robot machining. 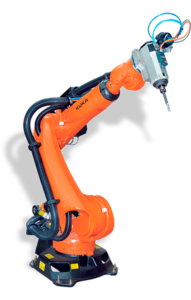 It’s true that robots are less accurate than a lot of traditional machine tools, as we discussed in the article Can a Robot Outperform a CNC Machine for Robot Machining? However, this doesn’t mean that they are inaccurate. Far from it! Industrial robots which have been designed for machining, like the High-Speed Machining range from Stäubli, have position repeatability down to 0.03 mm, which should provide more than enough accuracy for Brian’s operations. What’s more, you can improve the accuracy by using robot calibration. See our article Is Offline Programming Really Accurate? for more information on robot calibration. 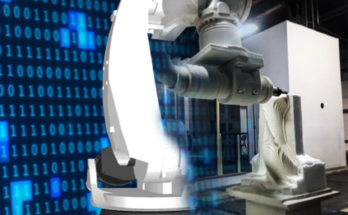 The question of “Are robots accurate enough?” should always be answered with a follow-up question: “How accurate do we need it?” For an increasing number of machining operations, robot accuracy is sufficient. Brian decides to go with robot machining, but his all problems are not yet solved. He needs to program the robotic task. However, he wants to find a programming solution which his team can handle in-house. In the past, he invested in a palletizing robot which was programmed entirely by an external integrator. While it has been working very well, his team doesn’t have the skills to reprogram the robot so it has started to become inflexible. 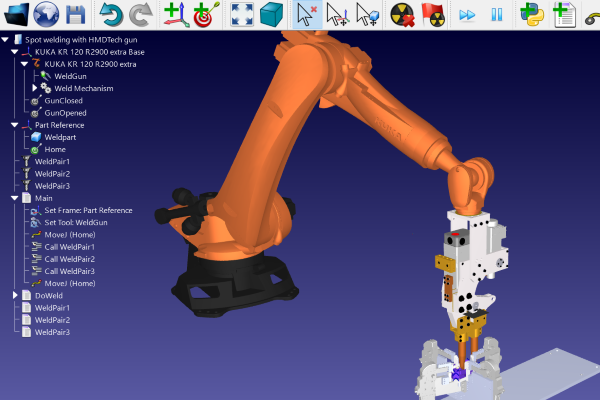 Brian discovers the Machining Utility in RoboDK. This tool makes it very easy to create machining paths. You just load up an NC file created by your CAM program and the software creates the robot path automatically. Now he has all the flexibility he needs to perform the finishing tasks. He and his team can easily program the task using RoboDK, load it into the robot and get back to their more productive work. As an added benefit, he can also now reprogram his previous palletizing robot using the same software, which improves his return on investment for that robot as well. 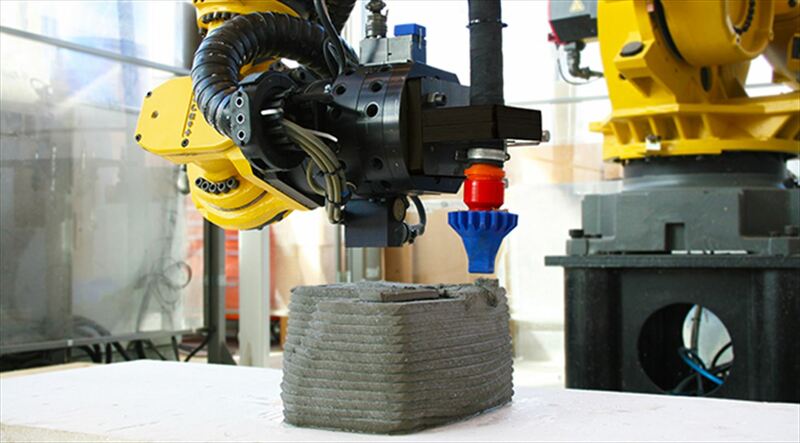 How Could Robot Machining Help Your Process? This was a fictionalized story, but it was inspired by real robot machining tasks. 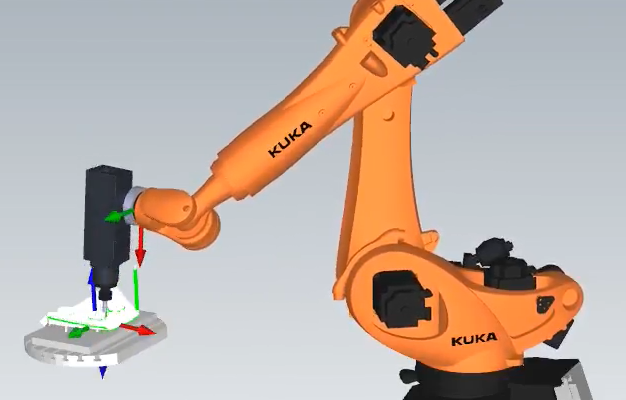 Check out the video case study from Heidenreich & Harbeck — where they used a KUKA robot to perform several finishing jobs on a large casting — and the case study from Audi — where they used Stäubli robots to machine molds. Now, think about your own situation. 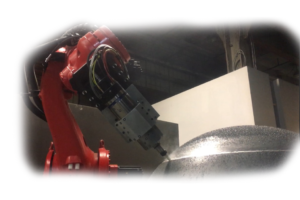 How could robot machining help your process? Tell us in the comments below or join the discussion on LinkedIn, Twitter, Facebook or Instagram. 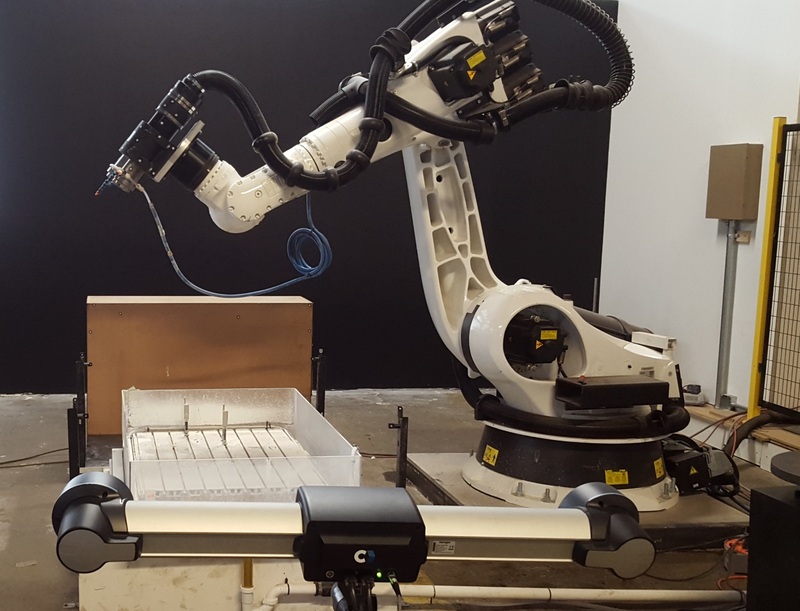 Can a Robot Outperform a CNC Machine for Robot Machining? 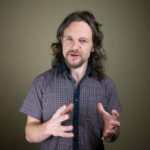 Alex Owen-Hill is a freelance writer and public speaker who blogs about a large range of topics, including science, presentation skills at CreateClarifyArticulate.com, storytelling and (of course) robotics. He completed a PhD in Telerobotics from Universidad Politecnica de Madrid as part of the PURESAFE project, in collaboration with CERN. As a recovering academic, he maintains a firm foot in the robotics world by blogging about industrial robotics. Robot helps much in different business industry. It could lessen the manpower and fasten the work and meet the goal easily.